In this way you will reuse the underlining functionality and parser of the LuceneQParserPlugin. The grammar of the parser is defined in QueryParser.jj file inside Lucene/Solr source code tree. The grammar that QueryParser.jj uses is BNF. The JavaCC tool implements parsing of such grammars and producing the java code for you. The produced code is effectively a parser with built-in validation etc. In Solr there is its own version of LuceneQParserPlugin: it is called QParserPlugin and in fact it pretty much implements almost the same functionality as its counterpart. 1. You implement your custom logic in GroundShakingQueryParser.jj that produces GroundShakingQueryParser.java. Make sure the class extends SolrQueryParserBase. 2. 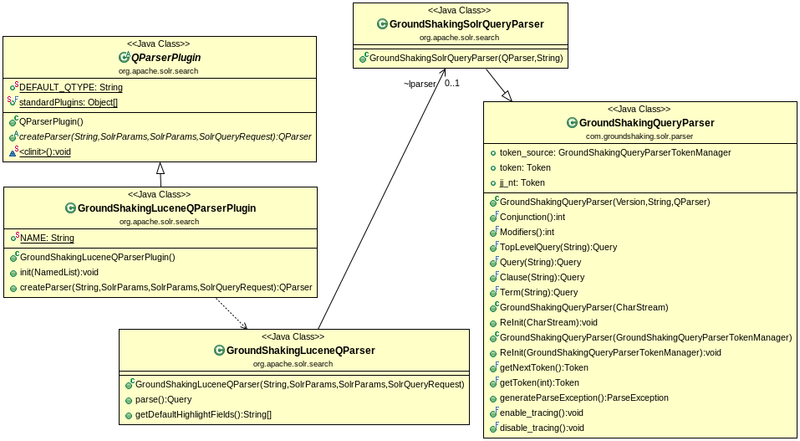 To wire this into Solr, we need to extend the GroundShakingQueryParser class in GroundShakingSolrQueryParser class. * Solr's default query parser, a schema-driven superset of the classic lucene query parser. * It extends the query parser class with modified grammar stored in GroundShakingQueryParser.jj. 3. Instance of GroundShakingSolrQueryParser is acquired in the GroundShakingLuceneQParser class. 4. GroundShakingLuceneQParser is wired into GroundShakingQParserPlugin that extends the aforementioned QParserPlugin. 5. Now we have our custom GroundShakingLuceneQParser which can be directly extended in our MyGroundShakingQueryParser! To use it, just specify the name in the defType=groundshakingqparser as a query parameter to Solr. By the way, one convenience of this implementation is that we can deploy the above classes in a jar under solr core's lib directory. I.e. we do not need to overhaul solr source code and deal with deploying some "custom" solr shards.